Welcome to Part 7 of "Mattel schools DC Direct," a continuing comparison of the ways in which even an old company set in its ways can really compete for fans' dollars by stepping up to face a new challenge. The tyrannical ruler of a vast intergalactic empire, Mongul amuses himself and his subjects with endless gladiatorial games staged on a barren planet called War World. We talked before about Mongul and his creation as a sort of "Darkseid lite" - he was a Thanos analogue, which made him, like, Darkseid's conceptual grandson or something. Though he survived the Crisis on Infinite Earths, eventually DC ran out of things for Mongul to do (even after giving him his own pseudo-Death Star to play with and letting him be the major villain in a big crossover), and so they killed him off in a fairly forgettable manner. 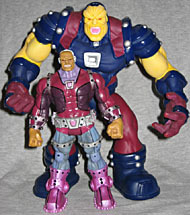 However, being a boring chracter is no barrier to being a good action figure, which is why Mattel has finally given us the Four Horsemen's version of Mongul in the DC Superheroes line. 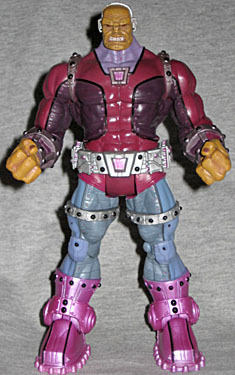 The best thing that could be said about DC Direct's Mongul was that it was big. Obviously Mattel's version can't even compete in that category - he's only 7" tall - but absolutely stomps all over DCD in every other respect. The Four Horsemen's sculpt is packed with so much detail, it makes the other Mongul look like an oversized JLU figure. It's not just the big things, like seams and rivets on the metal bands around his shoulders, legs and wrists, or the belt that would put Batman to shame - there's also the smaller stuff, like the texture of his skin, the veins on the back of his hands or the fact that his nose looks like it's been broken in a fight. Look at the sections of his costume that are banded metal, rather than just being a flat colored section, or the fact that the soles of his boots have distinct patterns. This is a killer sculpt. There should be no question that the articulation is good. Mattel is at least consistent about that. Mongul moves at the ankles, knees, thighs, hips, waist, torso, wrists, elbows, biceps, shoulders and head. The head, shoulders and hips are all balljoints (or at least have the same range of motion) and everything moves well. About the only things the figure might have that it doesn't are pegs at the top of the boots. Mongul's skin is a dirty yellow, and his suit is four different shades of purple. He's wearing light blue leggings, but even those have a darker tone on the insides. The metal parts of the costume are a nice silver, even that weird Lobot head sheath he wears. The bumps on the "metal" and the edges between the colored sections are black, and his eyes are red. 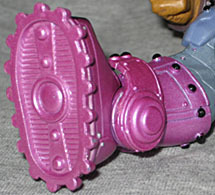 The rivets on the banded sections are all painted in a contrasting color, and save for a purple spot on his hand that was obviously supposed to go on his elbow, everything here is painted well - which is a good thing, because Mattel's lousy distribution has struck again. For some reason, Mattel insists on packing cases heavily with more and more Superman variations and repaints of figures we've seen before. That means old product lingers on the shelves, and nothing new can get rotated in. Mongul was supposed to be out months ago, but you still can't expect to see more than one of these in stores, yet, and that means you're stuck with the one you find. So far DCSH seems to be doing better than He-Man and Batman did, but I'm not sure how much longer that can last. These really are great figures, but they'd be much better if you could actually walk into a store and expect to find them.